The fascinating story of the Chinese presence in and influence on this country - our intertwined history from colonial times to today. Chinese 'presence' in Australia extends from well before the time of Captain Cook - trading with northern Australia long before Europeans came here - right through to the present day, with Chinese activities ranging from being the main customer for our iron ore, to their very extensive intelligence operations here. 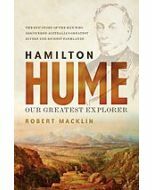 Robert Macklin, bestselling and critically acclaimed author of HAMILTON HUME and DARK PARADISE, has traced a new history of the two nations. Macklin's engrossing narrative reaches from pre-colonial times, to John Macarthur's 'coolie' shepherds, the only Chinese bushranger, Sam Pu, and the multiple atrocities committed against the Chinese in the gold rush; through to the 20th century, where the two Australians - 'Morrison of Peking' and William Donald - played a significant role in the downfall of the last Chinese emperor and the creation of the first republic, before World War II and decades of Cold War brinkmanship; to our current economic bonds and Australia's role in the dangerous geopolitics of the South China Sea.